Share this product and receive a $2.25 sharing discount. Give that special child a very special keepsake plate. Simply provide the child's name, birthdate, weight and length (if you have it). This plate is a one of a kind... handpainted and personalized in the US. All plates are lead-free, dinnerware and dishwasher safe. Understandably, personalized items cannot be accepted for return; however, if your order is not 100% accurate due to our error, you may return it in new condition and in its original packaging for a prompt exchange. All returns must be made within 30 days of receipt. If you have placed an order and realize you need to change or cancel it, updates must be made by the close of the next business day that your order was placed. Each and every plate is hand-painted and signed by Kathleen Virtue. Her trademark is the wonderful detail she gets by using teeny-tiny brushes on each plate. 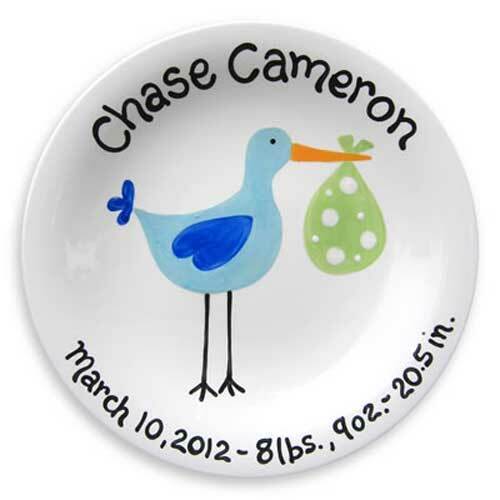 Personalizing every plate with names and dates transforms them from super cute plates to treasured keepsakes. Kathleen says, "Every plate has a story, just like all of us! ".